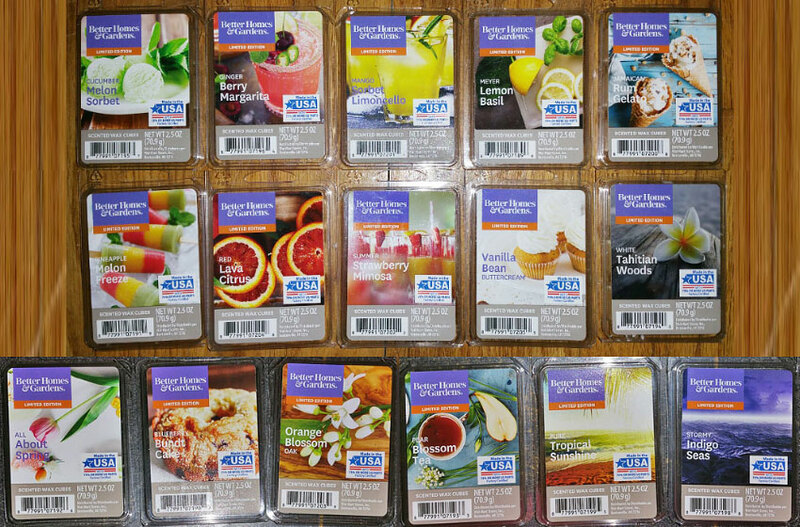 This is a review of Better Homes and Gardens Wax Melts from Walmart for Spring 2018. As usual, BHG does not disappoint. I love most of these scents! On cold sniff this smells like lovely hothouse lilies with a bit of a rubbing alcohol note. As I expected, when melted, the alcohol note disappeared completely and thankfully all that was left was the authentic hothouse type floral note, like lily or tulip petals with a green note. It's not a perfumey scent at all, or even overly sweet. I really like it. A lot of people don't like this scent, and on cold sniff I can understand why. On cold sniff it smells like fake blueberry flavored buttered popcorn, and it's nauseatingly sweet and buttery. However, when melted it smelled much better, more like a rich buttered blueberry muffin type scent with brown sugar. Still not authentic, and still extremely rich and sweet, but quite nice. Notes: Sliced summer, garden cucumber washes over juicy watermelon, sugared casaba and sweet honeydew swirled with a dash of luscious, white pear. I'm not a fan of cucumber or melon scents (unless it's a very sweet watermelon), so I don't care for this scent, although it's quite fresh and summery. It smells almost exactly like ScentSationals Cucumber Melon. But that scent was mostly melon with a cucumber note, and a smidgen of floral, and it was on the sweet side. This scent is more cucumber with melon, and the melon is kind of a cantaloupe rather than watermelon, so although it's a little sweet, it also has that bland watery cucumber note and the very slight smidgen of sourness from the cantaloupe (although it's not a sour scent at all). So although I don't like either scent, if I had to choose, I prefer ScentSationals Cucumber Melon. Notes: Minced ginger and tart red currant joining with refreshing herbal rosemary in a unique twist on the classic combination of fresh lime juice, lime zest, agave nectar, and sea salt. I smell ginger and a sweet berry note, but there's something in the background that I don't care for, a slightly sour or bitter note that may in fact be the ginger. It's a little sweet, but not sweet enough, and I think it has too much of the soapy ginger note and not enough berry. This smells heavenly! It smells like sweet rich butterscotch, maple and brown sugar with rum. And I can definitely smell the rum. It has a little bit of a creamy French vanilla note as well. Fantastic! When melted, it's VERY rich, almost nauseatingly so, so it's best suited for a very large room. Notes: Blend of mango sorbet and limoncello with iced gelato and crystallized sugar. Lemon zest and juicy orange add a bright sensation on top while vanilla cream and meringue adds a comforting finish. A very lemony scent, sweet with a very slightly salty note. It's not a kitchen lemon or a lemonade lemon, but maybe a bit of a bakery lemon, like a slightly sweet sponge cake soaked with lemon juice (although I don't actually smell cake notes). It's not the same as ScentSationals Iced Lemon Sugar Cookies or Better Homes & Gardens Iced Lemon Poundcake (both of those are much sweeter, with more bakery notes and less lemon). I only smell the lemon, not the mango, although I think I smell just a smidgen of mango on cold sniff only. I love lemon scents, and I really like this one. This is not the same scent as the new AmbiEscents Italian Limoncello or ScentSationals Limoncello Popsicle Fusion. Notes: Brilliant notes of effervescent meyer lemon zest sparkle with succulent lime, wild bergamot, and fresh-picked garden basil freshened with sweet orange and a touch of white pomelo. Fantastic rich zesty lemon scent with a bit of a savory note. I don't smell basil per se, maybe more of a little oregano? And there's just a smidgen of sweetness to keep it from being too savory. Melted, it has a grapefruit note too. Some people have said this smells like celery, although I don't smell that. This is a very pleasant scent, like something you can have melting in the background that won't annoy anyone. It does smell a little like orange blossom/neroli, and although it's sweet, it's not as sweet and rich as true neroli. It has a beachy vibe, with a Coppertone suntan oil note, and maybe a smidgen of a light wood note in the background. It smells a little bit like a sweeter, richer, more beachy ScentSationals Himalayan Pink Salt but without the shaving cream note. And the scent lasted the entire day. I love this one! Notes: Crisp greens and sparkling lemon that trails into a fruity heart of pear blossom and fresh apples. Sugared musk and vanilla bean compose a tantalizing base. On cold sniff this is pretty much what it says in the scent name. The perfumey floral note is in the forefront, and then equal notes of pear and green tea. Maybe also a hint of amber for warmth and richness. When melted, however, it's a sweet syrupy pear scent with a bit of a rich warm perfumey note, and I only smell a hint of the green tea. Looking at the notes, I don't detect lemon. It's a fantastic scent. It reminds me a little bit of last year's Better Homes & Garden's Georgia Peach Tea. This may be a dupe of several older ScentSationals and Better Homes & Gardens tropical scents. I smell pineapple and other tropical fruits, but it's not sweet at all. It has a waxy, very slightly sour note. I do detect the melon note as well, which smells like cantaloupe rather than watermelon or honeydew. It's an interesting scent although I'm not really a fan, but it's bringing back some memories... oh wait, it's the same scent as ScentSationals Tropical Fiesta! Which is one of the first scents I melted when I started getting into wax melts several years ago. This is not a tropical scent. I can't figure out the notes, but it's a little lemony with a hint of coconut and maybe warm amber, and possibly a smidgen of perfume. But it's not a perfumey or very sweet scent. When melted, it smells like celery with a slightly sweet lemon note. I'm on the fence about this scent. Notes: Tropical fruits and sugared citrus burst with hints of bright red currant and blood orange fused with lemon leaf and hints of musk. I like this one, but I think it might be too intense for a lot of people. It smells a lot like ScentSationals Molten Orange, which is an intense orange scent, but this scent is even more intense, a little sour and less orangey, like satsuma. It smells more like an older scent from 2014 or 2015 I believe, called Better Homes & Gardens Valencia Blood Orange, although that scent was more intense and even less orangey than this one. So I'd say Red Lava Citrus is somewhere between Molten Orange and Valencia Blood Orange. This is a fresh men's body wash scent with a slight peppery note. I've smelled it before, so it's probably a dupe of an older scent. It smells a bit like the old ScentSationals Rebel and ScentSationals Crimson scents, but fresher. Although it smells like a lot of other similar type scents, I like it. This scent is finally available in melts! It came out last year in candle format, and I loved it so much that I scraped the wax out of the candle to melt it. It's a super rich, sweet creamy strawberry scent with a little bit of saltiness. I don't smell pretzels per se, like no bready note, but the saltiness gives it an extra richness that makes this scent so fantastic. This smells almost exactly like last year's ScentSationals Pineapple Strawberry Smoothie. They're both sweet pineapple strawberry scents, and although this scent is more pineapple than strawberry, it's less pineappley than Pineapple Strawberry Smoothie. It's a sweet, yummy, refreshing combination, and it does smell like a smoothie, or a sweet pineapple strawberry hard candy. This is a fun, happy scent! Notes: Scrumptious notes of smooth vanilla blend with orange-sweetened buttercream swirled with zesty lemon accents and a dash of rich cane sugar. This is a fantastic vanilla cookie scent. I don't think it's a dupe of any other ScentSationals or Better Homes & Gardens vanilla scents. It's not the same as Better Homes & Gardens Vanilla Cookie Crunch, although they both do have a vanilla note. This is a vanilla buttercream scent with a tiny bit of lemon and possibly a smidgen of coconut. Looking at the notes, there's the lemon, and yes, I think I also detect a hint of orange as well. But it's neither a true lemon or orange scent, because those notes are very subtle. Fantastic! Notes: Warming accords of sandalwood, cedarwood, and Tahitian teak with a heart of exotic coconut, birch leaves and lavender. On top, bergamot waters, white pineapple, and sea salt air add a refreshing quality. I smell coconut, cashmere/amber for warmth, musk perfume, and a hint of rich fruit like blackberry or plum. It's a fantastic scent with a slight tropical note. There may also be a smidgen of vanilla, but despite the scent name, this is not a vanilla scent. It smells like a rich body cream, and I love it! I've heard it smells like Bath & Body Works Waikiki Coconut.